Title first published in 2003. In recognition of the power of organised labour, the ANC Government elected in 1994 granted South Africa's unions unprecedented legal and constitutional rights. Despite these gains, the country's unions have faced a fresh set of challenges, many of them emanating from their political allies in Government. From Parliament to the factory floor, South Africa's unions are now confronted with threats as dangerous as those they confronted when organising illegally in the heyday of apartheid. 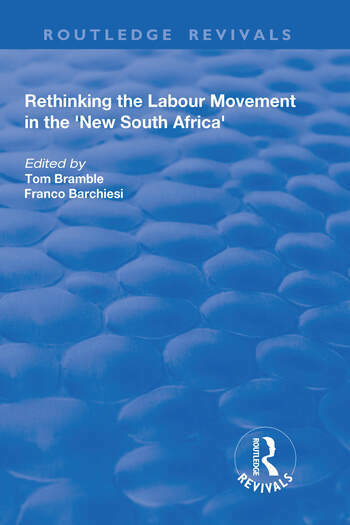 The purpose of this book is to examine how South African unions have responded and how well prepared they are to meet the challenges that confront them in the new millennium. Contents: Introduction, Franco Barchiesi and Tom Bramble. The Politics of Trade Unionism in the 'New South Africa': Neoliberal corporatism: origins and implications for South Africa, Lesley Catchpowle and Christine Cooper; The road to the right: COSATU economic policy in the post-apartheid period, Oupa Lehulere; COSATU and the tripartite alliance since 1994, Dale T. McKinley; Unions and privatisation in South Africa, 1990-2001, Maria van Driel; Black empowerment: a tripartite engagement with capitalism, Georgina Murray; The moment of Western Marxism in South Africa, Andrew Nash. Organising in the Shadow of Flexibility: Social citizenship, the decline of waged labour and changing worker strategies, Franco Barchiesi; Dealing with 'This Thing Called Gender': democracy, power and gender relations in trade unions, Liesl Orr; In search of greener pastures: trade unionism in the agricultural sector, Gilton Klerck and Lalitha Naidoo; Labour market flexibility in the retail sector: possibilities for resistance, Bridget Kenny. Organising Under New Rules: The Impact of the New Labour Relations Regime: Social movement unionism since the fall of apartheid: the case of NUMSA on the East Rand, Tom Bramble; Pressing challenges in the South African labour movement: an interview with John Appolis and Dinga Sikwebu; Bibliography; Index. Tom Bramble is Senior Lecturer in Industrial Relations at the School of Business, University of Queensland. Franco Barchiesi is Researcher and Lecturer in the Faculty of Political Sciences at the University of Bologna.